Last week, MEMS Industry Group held its annual members meeting, M2M (Member-to-Member) Forum at the Doubletree San Jose Hotel. Not only did we change the name of the event to better represent the purpose of the meeting, idea exchange among members, we celebrated a milestone of which we are very proud. MIG is 10 years old! 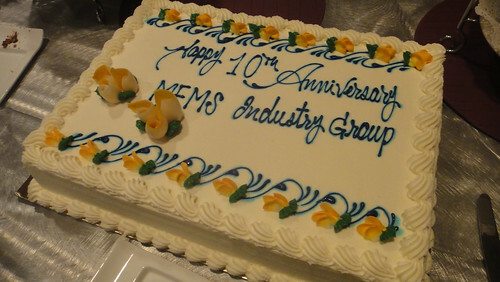 To mark the occasion, we treated attendees of our MEMS Testing Standards Workshop, M2M Forum, and members of the Bay Area MEMS Meetup Group to cake, cocktails, and a very special keynote address by Gary O’Brien, Ph.D., Director, Advanced MEMS Design Group, Corporate Research, Robert Bosch LLC. Everyone in attendance also got a MEMS Industry Group commemorative t-shirt! My last couple of posts have explored options and technologies for measuring magnetic fields (see “Magnetometers Come in Multiple Flavors” and “Magnetic Sensor makes Electronic Compass Design Easy”). Today, we’ll explore issues that you may encounter when using any magnetic sensor in consumer applications. To keep things simple, let’s consider the case where you’re integrating a magnetic sensor into a smart phone. Nominally, you would like to use your magnetic sensor to implement compass and navigation features. In a pristine environment, free from interference, we could take measurements directly from our sensor. The real world is not that simple.